Static dissipative carpet tiles are a good choice for providing adequate secondary grounding in non-manufacturing areas such as server rooms, critical control centres and data storage areas. 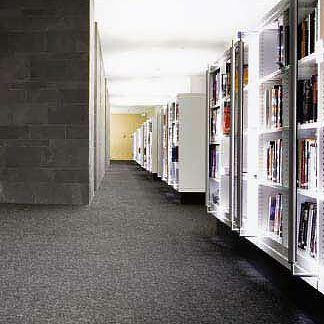 CX carpet is supplied in tile format which enables quick installation and incurs less wastage than sheet materials. The loop pile carpet tiles have a conductive backing and are available in a variety of colours. Where the customer requests installation by SSE, an initial survey will be undertaken by SSE’s engineers to assess the site conditions and advise on any necessary preparatory work. A brass foil grid is then put down and designed so that it makes direct contact with the underside of each CX tile. The tiles are stuck in place using an easy release adhesive which allows the tiles to be peeled up and lifted, if required. Finally, the tiles are linked to an earth connection point which also serves as a floor test junction box. Following an SSE floor installation, a Technical Manager will visit site, thoroughly test the floor to check its dissipative performance and issue a Certificate of Conformance to confirm it complies to the requirements of BS EN 61340. The loop pile carpet tiles have a conductive backing and are available in a variety of colours.